I shall not pretend to be a David Carradine fan. Because I never was. Though I'm glad we are both Sagittarians. All I know is that he starred in the seventies TV show Kung Fu. I've never even seen an episode of Kung Fu. Well, maybe I have, but I just don't remember it. Anyway, it was the Kill Bill films that introduced me to David Carradine, and from there, I found out that this guy was from a Hollywood acting dynasty. Like the Barrymores. And the Fondas. Their local equivalent would be the Eigenmanns. Or Eigenmenn. That was a joke. David Carradine was actually one of those who popularized martial arts in the Hollywood movies. Sort of like Bruce Lee, though not as great. And that is why Quentin Tarantino chose him to play Bill, simply because Carradine was a martial arts icon. And that is also the reason he appeared as an old Chinese gangster in Crank: High Voltage, which was his last completed film before his death. But the truth is, Carradine has no Asian blood in him. The only thing Asian about him is his spirit, and his love for martial arts. So let us mourn David Carradine's death, because it will deprive us moviegoers of his onscreen martial arts prowess. But let us also rejoice, for now David Carradine will get to spar with the master Bruce Lee himself, and all the other ancient Chinese masters before him. John Arthur a.k.a. 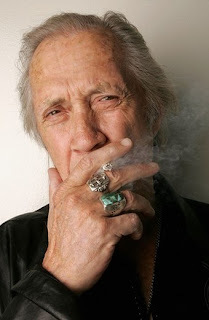 David Carradine. 1936-2009.